This section describes how Content Authors can search for different things in Crafter Studio while creating content. To do a search in Crafter Studio, point your mouse to the magnifying glass icon, which will then display the name of the icon, Search and then click on it. 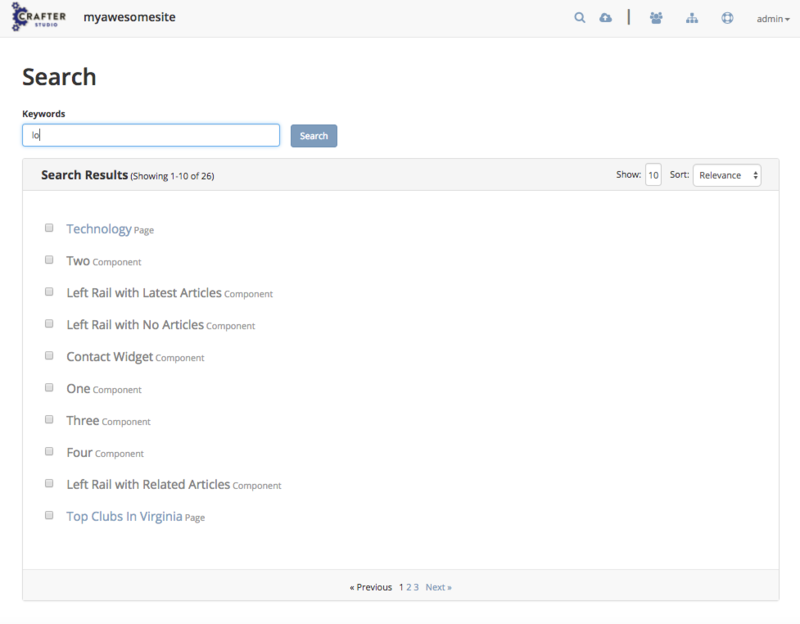 Search allows you to find objects in the system by filtering for them with keywords. Each result is a content type of one sort or another. The content type is listed next to each result. Result Selection: Note the checkboxes to the left of each result type. Just as you can select multiple items on the dashboard and then interact with them in bulk, the same is true with search. If you are in general search mode you will have checkboxes that allow you to choose many items and access to the context nav to take action on those items. If you are selecting specific items for a control in a form you will be able to choose whatever number of items are expected by the control. Search Pagination(Show): You can choose how many results you want to see per page. Controls at the bottom of the page allow you to move through the results.